NAMI Connecticut offers a number of programs to serve the needs of community and professional audiences. 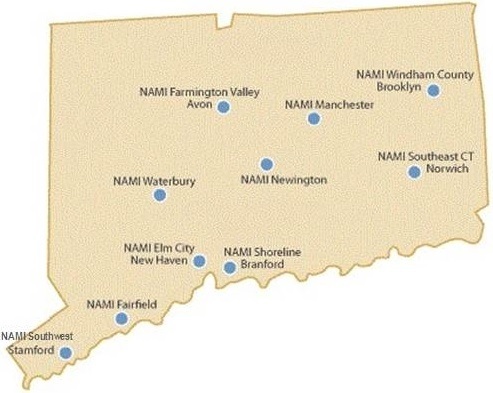 For more information on any of the programs listed here, please call the NAMI Connecticut office at: 1-800-215-3021. NAMI Connecticut offers customized professional presentations and in-service programs to meet the needs of a specific organization. Depending upon the time involved, a professional fee may be required. NAMI Connecticut is available to provide community groups with information on mental illness – including specific disorders, and our organization. These presentations can be tailored to fit a group’s specific needs and time allotment. NAMI Provider Education is a five-session staff development program for healthcare personnel who work directly with people affected by mental illness. This unique program is led by people living in recovery and by family members who share their personal, intimate perspective on their treatment experience. The material is also available in a 4-hour introductory seminar. Please Consider Donating or Joining NAMI Connecticut Today. Please consider donating or joining NAMI Connecticut today. We offer FREE Education, Support and Advocacy for families, professionals and those living with mental health issues. Please email ktierney@namict.org for more information on how we can support you as a professional.